This experience, while considered by many to be slightly insane, is very educational for me. It is an opportunity to learn while learning is optional and not mandatory, or driven by necessity. I’ve known too many people relegated to a lifestyle they didn’t anticipate with no foreknowledge, myself included. The saving grace in my sleeping arrangements is a gift I gave to my late husband six years ago this month – an ultralight feather bed. When we moved to VA to a very old house with little heat and regular below freezing weather and snow, he had trouble moderating his body temp while sleeping. My Nordic stock body type doesn’t seem to have that problem and runs more into trouble while trying to keep cool in the humid, overheated South. Irony there, as I was born in the South and he hailed from Chicago 🙂 But the feather bed worked for both of us; he stayed warm and I didn’t overheat unless he got too close, then it was like spontaneous combustion might occur, lol. I’ve been dragging that feather bed around for years now, although it surely isn’t needed in my current housing arrangements. For camping though, it is the bomb. My ten degree rated sleeping bag is made of a slippery, cold material that doesn’t seem to warm up very quickly, while the feather bed reflects my own body heat quickly. Now I know why ducks sleep with their faces under their wings. I did an experiment last night, as I was certain that the temperature inside my tent was nowhere near what the outside readings are. I took a bottle of water into the tent last night to see if it froze while in there with me. It didn’t. That means that in 13 degree outdoor temps with whippy winds, inside the tent where I was sleeping was higher than freezing. Above my head where my breathing condensed, there was ice this morning, even though the water bottle stayed liquid. I should take a thermometer to measure, and do a gradient reading of inner tent, outer tent and outdoor temps. 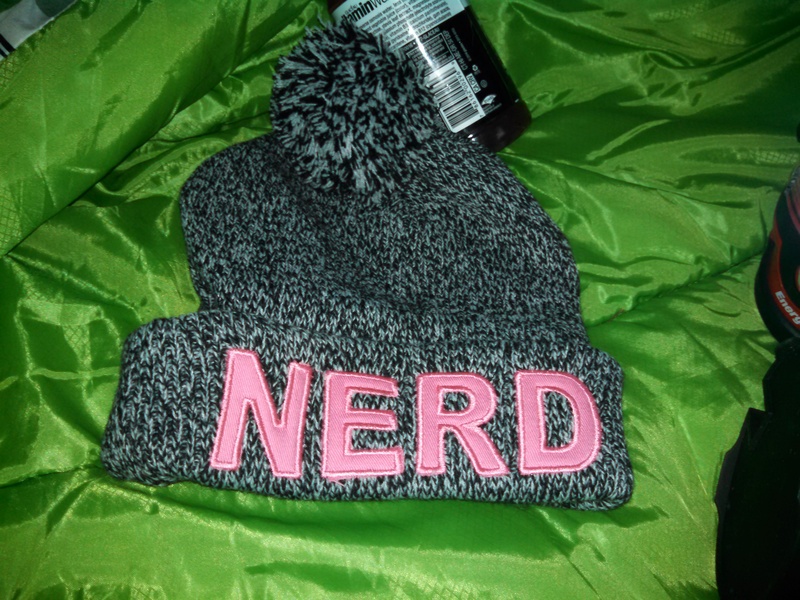 Now you know why my night cap has NERD on it, haha! Thought I was jesting eh? Dogs barking outside when in a house are a minor wakening with a quick drift back into sleep. Not so when they are about three feet from you barking at whatever at 4:30 AM. It was a hazy, warm kind-of-return-to-sleep on and off thing until time to get up. I knew when the household was awake, as the puppy tackles the tent looking for me and I have to yell at her to get off the tent. It is a smile-maker to unzip the inner door and hear them start circling, and then to unzip the outer door and find six bright eyes and three wagging tails communicating their pleasure. Seeing the rote way she goes through her day is so sharply painful for me, as I recall those first days vaguely. She and her husband would have celebrated their 42nd anniversary this month. This is so difficult, more difficult than I imagined. It is like having your heart torn three ways – the empathy of the grief and confusions she’s feeling; the slender thread by which I maintain my own fiscal health; and the risk of alienating a very small community by doing what is best for both me and her. I don’t wish this situation on anyone. Time to log in for work. Just sharing my adventures and my follies while on the road. Call it processing in type. I’ll leave one piece of advice for any of my male married readers. Think of your wives. Pass on skills she will need if you get stricken by illness or death. Don’t protect her. Prepare her, so that the loss of you will not be compounded by the bewildering array of what she needs to know to survive, and thrive. I cannot stress this enough, as one left alone unexpectedly, and watching another go through the same. The hat will get packed away until my next adventure sometime mid-Feb thru mid-March. Not much call for it down here in the tropics 🙂 But it is a fun, if goofy, piece of head wear, lol!